U.S. Supreme Court Justice Antonin Scalia is a caveman with backward views and anachronistic interpretations of the constitution. Of course, one is harmful (rat poison) and one is harmless (oatmeal), just as murder is harmful and homosexuality is benign. Furthermore, imprisoning innocent gay people for being who they are is cruel, while keeping murderers off of the street serves a legitimate public function. 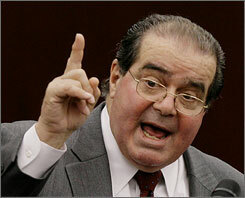 That Scalia can’t differentiate between evil acts and benign ones proves that he is an ideologue with ossified ideas. As Scalia often does in public speaking, he cracked wise, taking aim mostly at those who view the Constitution as a “living document” that changes with the times. On so many levels Scalia is an atrocious judge who is an embarrassment to the bench. History will judge the judge quite harshly.